The log pile is stacked and dry, even the smallest Marche villages are ablaze with Christmas lights, and already menus are being planned for the cenone di San Silvestro, the traditional gargantuan New Year's Eve dinner - once again it's the winter issue of the Marche Voyager newsletter. Sugar was once an expensive commodity in Italy and, along with honey, the people of Le Marche used to use concentrated grape must, or sapa, as an alternative. The thick, dark syrup is still made by slowly boiling white or red grape juice until it is reduced down by about two-thirds before being bottled. Its intense caramel and honey savour with a faintly sour edge is surprisingly versatile and works well with strong cheeses and simple grilled meat, or as a topping for ice cream and panna cotta. 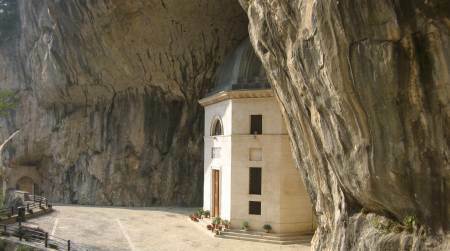 The photo below shows the remarkable octagonal church built by the celebrated 18thC Roman architect Giuseppe Valadier high up on the rock face of the Frasassi Gorge - not to be missed if you're visiting the nearby Frasassi caves. If you happen to be nearby over Christmas try to see the "living crib" where 300 locals dress up to play the traditional roles in the Christmas story on 26 December and 3 January; it is claimed to be the largest by extension in the world. The weeks leading up to Lent see Carnival celebrations in many Marche towns. Two of the most lively take place in Offida and Fano. In Offida on Shrove Tuesday bundles of canes stuffed with straw - known as i vlurd - are lit and taken in a flaming procession round the streets before being added to a giant bonfire in the main piazza. Carnival festivities at Fano are claimed to be some of the oldest in Italy, and feature a cavalcade of massive floats on the two weekends before Lent. If you're planning to visit Le Marche next summer, Macerata's spectacular 2010 open-air opera festival in July-August includes Gounod's Faust and Verdi's La Forza del Destino. Pesaro's prestigious Rossini Opera Festival in August includes Rossini's La Cenerentola and Sigismondo. The celebrated Giro d'Italia, one of the world's most famous cycle road races, again includes stages in Le Marche in 2010. On Thursday 20 May competitors cover nearly 200 kilometres heading along the southern Marche coast before making an inland detour to Macerata and finishing back by the sea at Porto Recanati. The following day they head north along the coast to finish after 222 kilometres. The 2010 race runs from 8 to 30 May and starts in the unlikely city of Amsterdam. The Touring Club Italiano has now awarded 17 of its prestigious "Orange Flag" awards to Marche towns. The Bandiere Arancioni Touring are given to small inland comuni across Italy in recognition of the quality of what they offer the tourist while not sacrificing the environment. The scheme was launched by the TCI, Italy's leading independent tourism association, in 1999 to give an incentive to smaller corners, away from the country's better known coastal resorts, who take their visitors seriously. The Marche comuni given the award are Acquaviva Picena, Camerino, Corinaldo, Genga, Gradara, Mercatello sul Metauro, Mondavio, Montecassiano, Montelupone, Monterubbiano, Ostra, Pievebovigliana, Ripatransone, San Ginesio, Sarnano, Staffolo and Urbisaglia. The Marche "brand" is set to get a major boost with a couple of TV ads featuring Hollywood divo Dustin Hoffman. The two short films feature the actor reading Giacomo Leopardi's celebrated poem L'Infinito against a backdrop of some of the region's most idyllic countryside. Hoffman first fell in love with Le Marche 37 years ago while filming in Ascoli Piceno. Five native-born marchigiani have made it to the Papacy - Popes Sixtus V (1585-90), Clement VIII (1592-1605), Clement XI (1700-21), Pius VIII (1829-30) and Pius IX (1846-78).